After last month's heavy and solemn reading, there is definitely a theme of YA in my library haul, and 'chick lit' in my ebook queue. How beautiful is the cover of Everything, Everything ? I'm excited to read that one - I've heard nothing but good things. 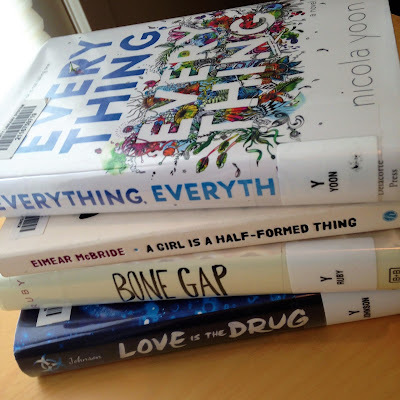 I'm also really curious about Bone Gap (the Printz winner and National Book Award finalist) as I've seen it can be categorized in sci-fi and I had no idea, based on the description. Love Is the Drug is a direct result of listening to What Should I Read Next, the awesome podcast Anne Bogel started, which I highly recommend. I'd never heard of this title until she recommended it to Osheta Moore who wants to read more books written by authors of color. The story sounds SO GOOD. And I still have another month to renew A Girl Is a Half-formed Thing , so that one might get pushed back again. Honestly, most of these might get pushed back, because I'm going to be relying on my Kindle a lot next week for some vacation reading!! My husband and I are going to San Diego for a couple of days, and plan to do a LOT of pool reading if the weather cooperates. To that end, I put a Sarah Dessen, Jojo Moyes and Elin Hilderbrand into my Overdrive queue and they're suspended/ready to go. I kinda hope I'm Glad About You comes in soon, too, as there are only two people ahead of me. OMG, you need to read Red Rising RIGHT NOW!!!!! The final book came out last month. It's SOOOOOOOOO good. My not-a-book-lover husband devoured all three of these books in days. Also, have you read Americanah? That is a great book by a woman of color. Oooh, maybe I'll have to go for Red Rising over chick lit! Americanah is on my radar, but it wasn't necessarily my goal - just that the story sounded amazing, no matter who wrote it! But, to that end, I'd recommend Between the World and Me wholeheartedly.